For the U.S. Senate historian, see Donald A. Ritchie. Donald Richie (17 April 1924 – 19 February 2013) was an American-born author who wrote about the Japanese people, the culture of Japan, and especially Japanese cinema. Although he considered himself primarily a film historian, Richie also directed a number of experimental films, the first when he was 17. Richie was born in Lima, Ohio. During World War II, he served aboard Liberty ships as a purser and medical officer. By then he had already published his first work, "Tumblebugs" (1942), a short story. In 1947, Richie first visited Japan with the American occupation force, a job he saw as an opportunity to escape from Lima, Ohio. He first worked as a typist, and then as a civilian staff writer for the Pacific Stars and Stripes. While in Tokyo, he became fascinated with Japanese culture, particularly Japanese cinema. He was soon writing movie reviews in the Stars and Stripes. In 1948 he met Kashiko Kawakita who introduced him to Yasujirō Ozu. During their long friendship, Richie and Kawakita collaborated closely in promoting Japanese film in the West. He began composing contemporary music and released a title for ballet at that time. After returning to the United States, he enrolled at Columbia University's School of General Studies in 1949 and received a B.S. degree in English in 1953. Richie then returned to Japan as film critic for The Japan Times and in 1959 published his first book, The Japanese Film: Art and Industry, coauthored with Joseph Anderson, which gave the first English language account of Japanese film. The greater tolerance in Japan for homosexuality than in the United States was one reason he gave for returning to Japan, as he was openly bisexual. He spent much of the second half of the 20th century living and working alone in Tokyo, with the exception of a brief marriage to the American writer Mary Evans from 1961 to 1965. Richie served as Curator of Film at the New York Museum of Modern Art from 1969 to 1972. In 1988, he was invited to become the first guest director at the Telluride Film Festival. Donald Richie with portrait by Carl Randall, made at Richie's home in Ueno, Tokyo, 2006. Richie was a prolific author. Among his most noted works on Japan are The Inland Sea, a travel classic, and Public People, Private People, a look at some of Japan's most significant and most mundane people. He has compiled two collections of essays on Japan: A Lateral View and Partial Views. A collection of his writings has been published to commemorate fifty years of writing about Japan: The Donald Richie Reader. The Japan Journals: 1947-2004 consists of extended excerpts from his diaries. In 1991, film makers Lucille Carra and Brian Cotnoir produced a film version of The Inland Sea, which Richie narrated. Produced by Travelfilm Company, the film won numerous awards, including Best Documentary at the Hawaii International Film Festival (1991) and the Earthwatch Film Award. It screened at the Sundance Film Festival in 1992. Author Tom Wolfe described Richie as "the Lafcadio Hearn of our time, a subtle, stylish, and deceptively lucid medium between two cultures that confuse one another: the Japanese and the American." Although Richie spoke Japanese fluently, he could neither read nor write it proficiently. Richie died, aged 88, on February 19, 2013, in Tokyo. Richie's most widely recognized accomplishments were his analyses of Japanese cinema. With each subsequent book, he focused less on film theory and more on the conditions in which the films were made. There was an emphasis on the "presentational" nature of Japan's cinema, in contrast to the "representational" films of the West. In the foreword to Richie's book A Hundred Years Of Japanese Film, Paul Schrader writes, "Whatever we in the West know about Japanese film, and how we know it, we most likely owe to Donald Richie." Richie also penned analyses of two of Japan's best known filmmakers: Yasujirō Ozu and Akira Kurosawa. Because Richie was a friend of Fumio Hayasaka, who composed music for the cinema, he first met Kurosawa on the set of Drunken Angel, the director's initial collaboration with Toshiro Mifune. Richie wrote the English subtitles for Akira Kurosawa's films Throne of Blood (1957), Red Beard (1965), Kagemusha (1980) and Dreams (1990). In the 21st century, Richie provided audio commentaries for The Criterion Collection on DVDs of various classic Japanese films, notably those of Ozu (A Story of Floating Weeds and Early Summer), Mikio Naruse (When a Woman Ascends the Stairs), and Kurosawa (Drunken Angel, Rashomon, The Lower Depths, and The Bad Sleep Well), among others. Essays in Contemporary American Literature, Drama and Cinema (in Japanese). Hayakawa Shobo. 1950. This Scorching Earth. Charles E. Tuttle. 1956. Eight American Authors. Kenkyusha. 1956. Where Are the Victors? Tuttle Publishing. 1956. ISBN 978-0804815123. The masters’ book of Ikebana: background and principles of Japanese flower arrangement, edited by Donald Richie & Meredith Weatherby; with lessons by the masters of Japan’s three foremost schools: (hardcover). Bijutsu Shuppansha. 1966. Ozu: His Life and Films (paperback). University of California Press. 1977. ISBN 978-0-520-03277-4. With Ian Buruma (photos) (1980). The Japanese Tattoo (hardcover). Weatherhill. A Taste Of Japan (hardcover). 1985. Kodansha Intl. Ltd.
A Lateral View: Essays on Culture and Style in Contemporary Japan (paperback). Stone Bridge Press. 1992. ISBN 978-0-9628137-4-0. Tokyo (paperback). Reaktion Books. 1999. ISBN 978-1-86189-034-4. The Donald Richie Reader: 50 Years of Writing on Japan (paperback). Stone Bridge Press. 2001. ISBN 978-1-880656-61-7. The Japan Journals: 19472004 (paperback, Ed. Leza Lowitz). Stone Bridge Press. 2005. ISBN 978-1-880656-97-6. Japanese Portraits: Pictures of Different People (Tuttle Classics of Japanese Literature) (paperback). Tuttle Publishing. 2006. ISBN 978-0-8048-3772-9. A Tractate on Japanese Aesthetics (paperback). Stone Bridge Press. 2007. ISBN 978-1-933330-23-5. Stephen Mansfield (Introduction) (2007). Travels in the East (paperback). Stone Bridge Press. ISBN 978-1-933330-61-7. Among the short works not included in the collection are for example Small Town Sunday (1941, 8 mm), filmed when he was still resident in the United States, A Sentimental Education (1953), Aoyama Kaidan (1957), Shu-e (1958), and Life (1965). Japan Foundation: Japan Foundation Award, 1995. ↑ Corkill, Edan (1924-04-17). "Writer Donald Richie dies at 88". The Japan Times. Retrieved 2013-02-19. ↑ Sharp, Jasper (December 8, 2003). "Midnight Eye Interview: Donald Richie". Retrieved 2009-01-10. ↑ Bloom, Livia (October 21, 2006). "A Pinewood dialogue with Donald Richie". Museum of the Moving Image. ↑ Yoshida, Yukihiko, Jane Barlow and Witaly Osins, ballet teachers who worked in postwar Japan, and their students, Pan-Asian Journal of Sports & Physical Education, Vol.3, Sep. 2012. ↑ Fackler, Martin (2013-02-19). "Donald Richie, American Expert on Japan, Is Dead at 88". The New York Times. Retrieved 2013-02-20. ↑ VINCENT CANBY (1992-06-17). "Review/Film; Searching for Japan, In a Sea, in a Mind And in Metaphor". New York Times. Retrieved 2008-08-05. ↑ "Life in Japanese Film: Donald Richie". FORA.tv. Retrieved 2012-08-23. ↑ Matt Schudel (2013-02-20). 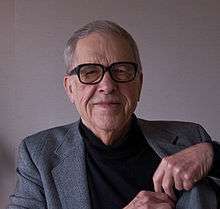 "Obituary; Donald Richie, American writer on Japan, dies at 88". Washington Post. Retrieved 2013-02-20. ↑ Global Discoveries on DVD retrieved on 2009-01-10. 1 2 Sharp, Jasper (March 6, 2005). "A Donald Richie Film Anthology". Retrieved 2009-01-10. ↑ Japan Foundation Award, 1995. Prideaux, Eric (September 1, 2002). "Films, Zen, Japan/Close-up: Donald Richie". Retrieved 2010-02-14.